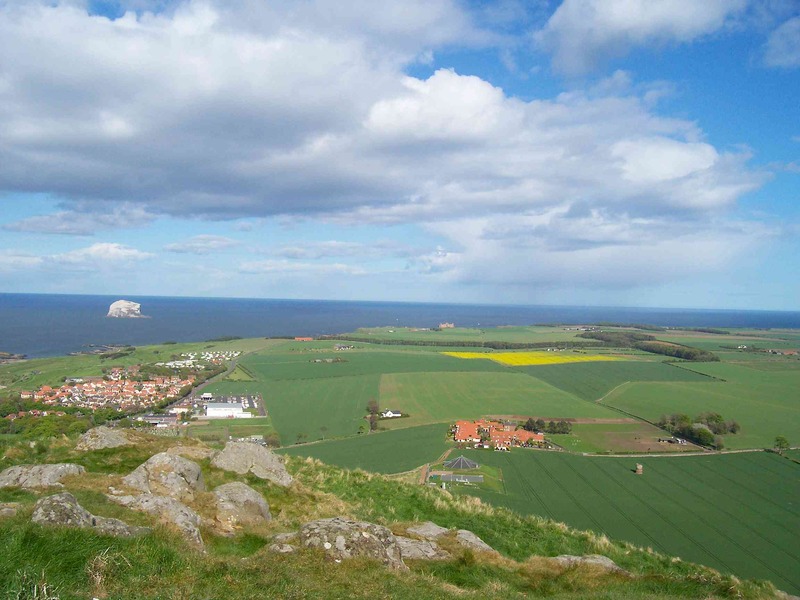 Unluckily, the day scheduled by the local Friends of the Law & Glen (FLAG) for me to give an informal history walk up Berwick Law was so resolutely driech that the summit, though only at 200m, was firmly in the clouds. Undaunted, we set off and followed the usual ascent, curving round the back above the disused quarry and stopped there to discuss the iron age Gododdin settlement found but never fully excavated there. Available history of the Law itself is thin but I had thought that its isolation makes it a unique vantage point to discuss the history of East Lothian, the Forth islands and the south Fife shore all laid out around you. What was fascinating to me was that, as each stop we made, someone had a piece of information to add to the jigsaw: a stone circle new to me; the link between the small water trap below the west shoulder and the WWI observation post near the summit; that local volcanoes were active 200m years before those on Mull and Skye. Going no farther than the halfway point of the bench on the west shoulder, getting wetter by the minute and occasionally losing sight of Fife or even the town as clouds swept by, it was still enlightening to look at the landscape through the eyes of the past. This blog speculated earlier that this area might once have been an island and, as such, well placed to develop as a key crossroads for eastern Britain. That idea, its ample size and its key location all become clearer from the Law. You can see both Gododdin capitals at Traprain and Castle Rock. You can witness how much shorter it is from Earlsferry to Yellowcraig and how a hillfort hidden in Eilbotle (OE = “old settlement”) Wood make plausible an early pilgrim ferry leaving from there. It’s obvious (pre-Forth Bridge) why a railway to Anstruther, a ferry to NB and a line on southwards looked like a winner in the 1840’s. I’m just relieved the final link of an embankment round the West Bay to NB harbour was never built; it would have ruined the prettiest town beach in Scotland. The vantage point makes it clear why, for a thousand years, the invasion route led through here and therefore more battles fought than in any other county. You can’t quite see Ormiston where Cockburn revolutionised agriculture and gave us the open field patterns we see as natural today but you can see the great sweep of the Lothian and Fife coalfield that powered half of Scotland’s major contribution to the industrial revolution. Even in the little town of North Berwick right at our feet, you can see the early harbour, the tight confines of the medieval town, the grandiose Victorian mansions stretching to the west, balanced by a later ‘cooncil scheme’ to the east and then more recent clumps of commuter homes tacked on around the edges. Coming up here above the normal perspective puts a distance between you and the everyday but, in compensation, gives an overview of not just the place but its history. For putting things into perspective—even on a driech day—it’s hard to whack.